On May 10, a distinguished 15-member delegation from Suzhou’s Jiangsu Province arrived at Portland City Hall for an economic development meeting. It was led by Deputy Director Wu Hui, Division of Foreign Affairs, Department of Commerce in Jiangsu Province. The City of Portland was represented by Hector Miramontes, International Relations Director and Chido Dhliwayo, International Relations Associate from the Mayor’s Office. Sunun Setboonsarng, Global Trade Specialist and Colin Sears, Business Recruitment Officer represented Business Oregon. Portland-Suzhou Sister City Association was represented by Lynne McIntyre, President, and Robert Fraser Vice President. Bureau and Section Chiefs represented a number of cities, districts and industrial zones from Jiangsu Province including Suzhou and: Nanjing, Wuxi Xinwu, Liyuan, Jiangyin, Yizeng, Donghai and Suqian. Company executives represented Jiangsu Holly Corporation, Jiangsu Hiteker High Tech Co., Ltd., Suzhou Dongde Intelligent Electric Automobile S&T and Innovation Park, Lianyungang Jingdu Group, Nanjing Mecom Company and Jiangsu HJH Science and Technology Co. Ltd. Lynne McIntyre commented after the visit “This was a wonderful delegation representing different economic, business and government interests. We were very pleased that there were representatives from Suzhou among their number. The Business Oregon presentation caught the interest of several delegates, particularly those factors that set Oregon and Portland apart from the communities the delegation visited in the Los Angeles area. They seemed incredulous that Oregon does not have a sales tax and expressed great interest in our tax incentives. A number of business and educational opportunities were explored for future pursuit and follow up”. 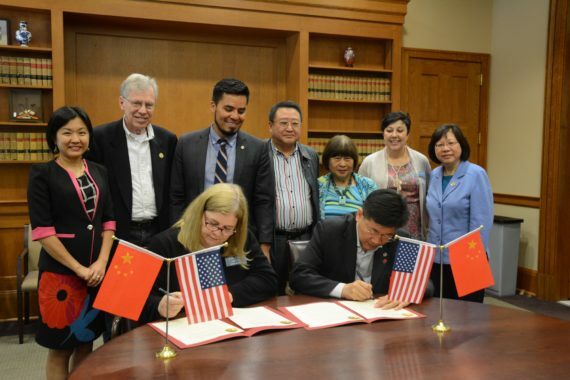 The Mayor’s Office, represented by Hector Miramontes, Director of Foreign Relations, and the Portland-Suzhou Sister City Association, represented by President Lynne McIntyre, welcomed the Suzhou Cultural Bureau led by Mr. Jie Li, Director General of the Suzhou Cultural Bureau. Also accompanying the Suzhou delegation was Mr. Shi Hai Chen, Director of the Zhangjiagang Municipal Bureau of Culture and their Assistant Ms. Jincy Chen. The purpose of the meeting was to restate the commitment of Portland and Suzhou to the enduring friendship between the two cities and to discuss the opportunities provided by the 2018 PSSCA 30th Anniversary Celebrations, and to build upon the two sister city’s cooperation of cultural exchanges. After discussing a number of exciting opportunities at this meeting, a Memorandum of Understanding was signed. The ultimate goal, as stated by Mr. Jie Li is to achieve a cultural project that will have an enduring affect for generations to come. Also attending the meeting were Robert Fraser, PSSCA VP; Lisa James, Executive Director of the Lan Su Chinese Garden; Jean Li and Frances Li, PSSCA Board Members, Cathy Chinn, PSSCA Past President; and Helena Gao, Editor of China Media. In October 2014, we extended Portland’s warmest welcome to a very high level delegation from our Sister City Suzhou. The delegation members included: Mr. Zhou, Yulong - Vice Director of Suzhou People’s Congress. Head of delegation. In charge of Agriculture, Economy & Industry for Suzhou. The highlights of their visit included an official meeting with Mayor Charlie Hales in Portland City Hall, a presentation on Portland's "We Build Green Cities" initiatives by Michael Gurton of the Portland Development Commission, and a banquet hosted by the Portland-Suzhou Sister City Association at the University Club. The delegation also was very warmly welcomed at Nike Campus with a presentation and a walking tour of the campus. They were also able to take in other highlights in Portland and Oregon area. Their visit was very productive and they expressed interests in the "We Build Green Cities" program and invited the Portland Development Commission for follow-up visits to Suzhou. Our organization helped to make arrangements for the Portland Development Commission's China trip to Suzhou in June 2015.